Jake 29's Story . . .
Senior Springers may enjoy their summer days being lazy ones but, for young Springers, the best days are ones filled with busyness…lots of it…and with a good measure of variety. Understanding that, Jake’s foster family is keeping him busy and he likes it! Jake’s a very smart dog that loves walks, swimming and fetch. He has a foster buddy right now and hangs out with him very well at home. 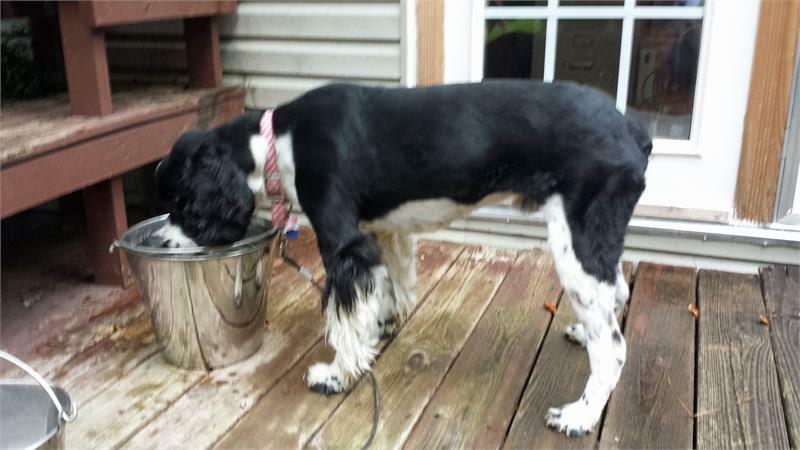 They share their foster mom’s time when the game is “fetch” and they share a water pail at the same time when quenching their thirst. Jake gets to do nose work at home too. He can identify the exacting paths of rabbits and squirrels through his large yard. The resident cat doesn’t appreciate that Jake continues to enjoy a chase and avoids him in general. . When both critters are out and about, their mom simply has to watch that chases don’t become too intense. A small step forward in their relationship does count as progress; when the cat is in his condo, Jake can approach and all is okay. Thank you, Jake! When his family traveled to join other MAESSR families and friends at the Rainbow Bridge picnic in Williamsburg, Virginia, Jake was up for the road trip. The day was unseasonably hot so, between festivities, there was time to cool down in the water. With a beautiful pond and the York River a few minutes from the picnic shelter, Jack loved the swimming there. Like any Springer, young or old, Jake is a great dog for watching TV and all-around hanging out. Belly rubs are his favorite. He might be a nice prospect for a family wishing to explore the sport of nose work or agility. If a versatile and active dog is what you’re looking for, ask about meeting Jake. With lots of potential, his future is bright. 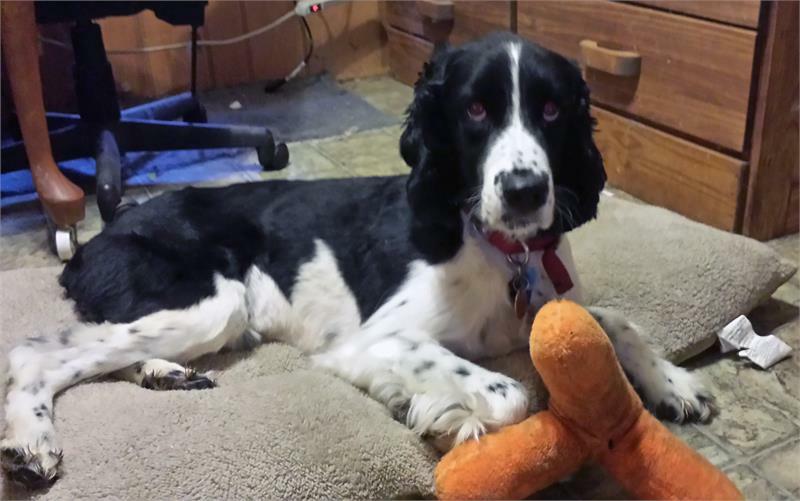 When Jake’s Virginia owner decided to return to college, she knew her young Springer friend could not go with her and that finding him a new home would be the best thing for him. Returning him to MAESSR was a tough choice but the right one for Jake. Jake is settling in with his foster family well. He likes to be with his people and is especially fond of his 17 year old human friend who is working with him on agility jumping. His previous owner reported Jake had been picked on by some other dogs, making him shy around them and avoiding them if possible. His foster mom is working with him on this with the help of the two friendly young resident Springers. Jake is also taking medication to help him with stress and he is much calmer as a result. Unfortunately, the elderly resident cat is getting no rest with Jake around as he thinks chasing kitties is good sport. Wrong! Well housetrained and crate trained, Jake sleeps in his crate at night and when he wants some quiet time during the day. Or, he rests on one of the comfortable dogs beds. A very quiet boy unless he needs to go out, Jake then vocally lets his needs be known. Trustworthy, Jake is not crated when his foster family is out of the house. Although his house manners are generally good, he will counter-surf. Hey, he thought his foster mom didn’t want that last pizza slice! Jake loves squeaky toys, and, when he feels like playing fetch, he picks a toy from the toy box and then hands it to his foster mom so the game can begin! Even when playing, Jake is quiet. 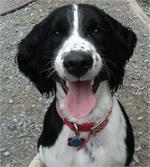 This youngster knows basic obedience commands but needs happy rewards as incentives. Soon, Jake will be ready for a forever home of his own. He is even going to the MAESSR picnic on June 13 to scout for prospects! Look for Jake there. You’ll be delighted with him! 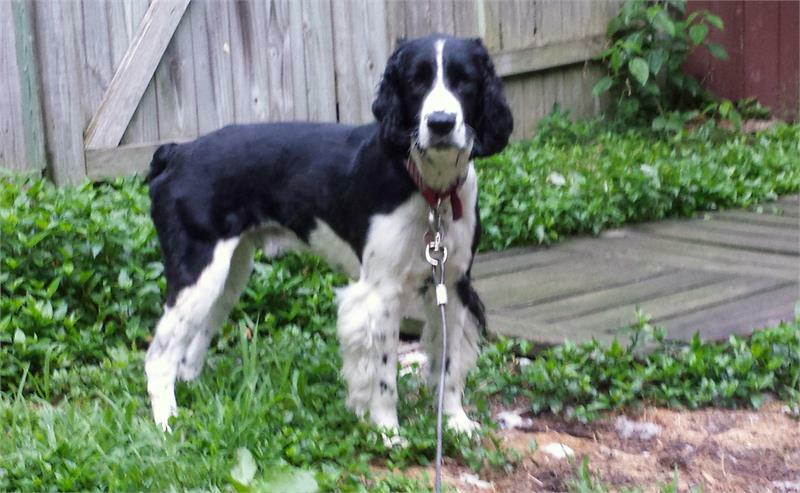 Jake came to MAESSR because he was too much for his Virginia owner to handle. 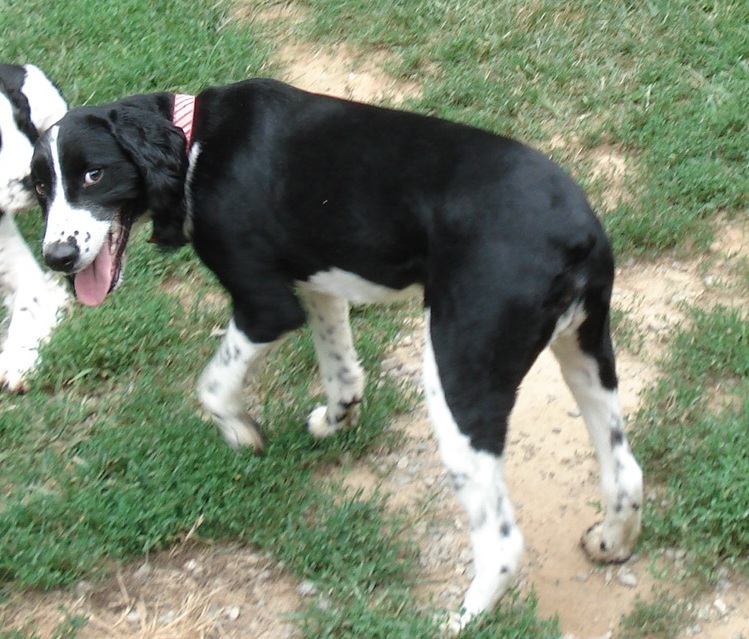 He is a high energy young Springer with some anxiety issues. 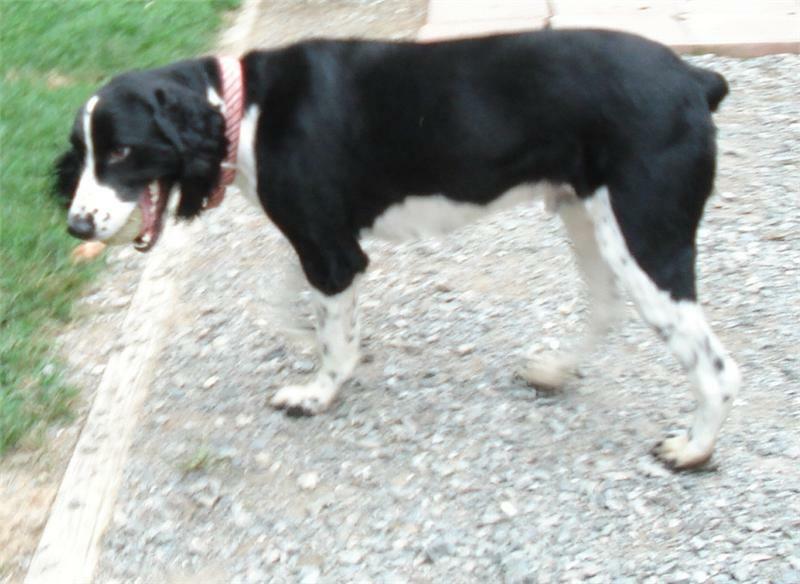 His owner was very sad to see Jake leave but knew that he needed a home where he would get more exercise and training. MAESSR’s young man is such a lover boy. He has great house manners, likes to cuddle and be as close as he can be to his person—especially if it means indulging in his love of furniture! Jake is housetrained and has learned to use the dog door in his foster home. While he has not had formal obedience training, he does know “sit,” “stay,” and “down” with either visual or verbal commands. But, as a typical Springer, he will counter-surf whenever the opportunity presents itself!! Outdoors, this youngster loves to run, explore and can play fetch for hours. Jake also likes to swim, play with squeaky toys and loves to ride in the car. He will pull on his leash, but calms down quickly. Grooming was a new experience for Jake, and he did become very agitated when the groomer got to his head, neck and front feet. About a year ago, when Jake was nine months old, his former owner was riding her bike; Jake was trailing behind her, unleashed, when a much larger dog in the neighborhood ran out and attacked Jake. Since that time, Jake has been afraid of anything with wheels (bikes, strollers, wagons) and handles this fear by barking at and trying to attack the offending wheeled vehicle. This handsome fellow has been on anti-anxiety meds, but is now being changed to a new one that his foster mom feels will be better for him. Hopefully, with obedience training and new family structure, he will be able to be weaned off the anti-anxiety medication. Jake is a very smart boy, intelligent and eager to learn. MAESSR is going to require two series of formal obedience classes within six months of adoption from his new family. 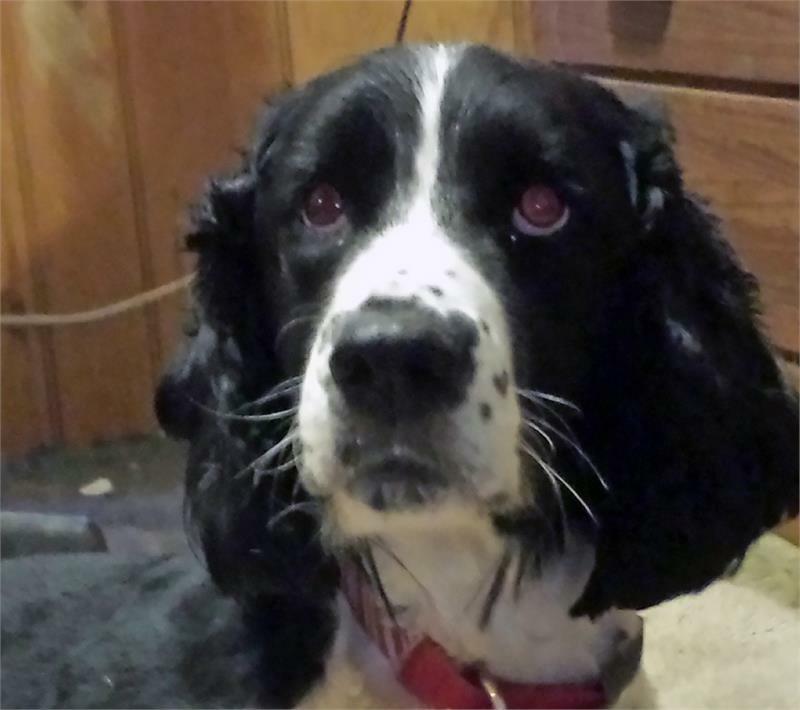 With Jake’s energy, and anxiety, he needs someone willing to spend the extra time showing him how really good Springer boys act—and being the clever guy he is, he’ll reward that person by quickly learning new behaviors and offering tons of spaniel kisses and love.